The middle third of the 20th century saw tremendous changes in the oil industry. Beginning with Standard Oil's activities in Saudi Arabia, oil prospecting began a global expansion; in fact, the internationalization of oil excavation and distribution played an important role in World War II, as better access aided the Allied effort. Meanwhile, scientific discoveries and inventions fueled a market for petroleum products in plastics, synthetics, and other industries. But along with the benefits of technology came, eventually, the awareness of environmental damage and risk in connection with the oil industry. 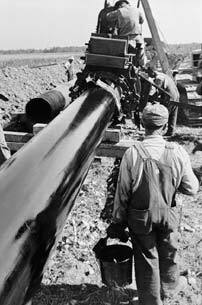 In the 1940s this pipeline was the longest ever built, running almost 1,400 miles (2,240 kilometers) from Texas to the Atlantic coast. Saudi Arabia allows Standard Oil to begin prospecting for oil in the country's eastern province. In 1938, the company's efforts paid off when a well near Dhahran yielded commercial quantities of crude oil. Du Pont scientist Wallace Carothers invents Nylon, the first purely synthetic fiber, using petroleum-based hydrocarbons. The Allied forces' access to oil was considered a crucial factor in their victory over the Axis powers in World War II. Recognizing the limited supply of oil resources and its importance to the future of the nation, oil policy becomes a high priority for the U.S. at the end of the war. Some experts point to a 1945 meeting between President Roosevelt and Saudi Arabia's King Abd al-Aziz Ibn Saud as a formative point in the future of U.S.-Saudi relations. Robert Banks and fellow research chemist Paul Hogan discover two new types of plastic, called crystalline polypropylene and high-density polyethylene (HDPE), while working for Phillips Petroleum. The plastics, first marketed under the brand name Marlex, are responsible for many of the common plastic products found today such as milk jugs, carpeting, and housewares. One of the first uses for Marlex was to make Wham-O hula hoops. On September 14, the Organization of the Petroleum Exporting Countries (OPEC) is formed for the purpose of negotiating with oil companies on matters of petroleum production, prices, and concession rights. The first member nations of the cartel are Iran, Iraq, Kuwait, Saudi Arabia, and Venezuela. One of the largest oil reserves in North America is discovered in Alaska's Prudhoe Bay. Alyeska, a consortium of companies lead by British Petroleum, was formed to extract the oil build a pipeline to transport the crude oil more than 800 miles south to the nearest ice-free port, in Valdez. U.S. President Richard Nixon authorized the construction of the $8 billion Trans-Alaska Pipeline in 1973, and oil began flowing through it in the summer of 1977. An offshore drilling platform operated by Union Oil Company six miles off the coast of Santa Barbara, California, creates cracks in the sea floor that cause more than 200,000 gallons of crude oil to be released into the Pacific Ocean. 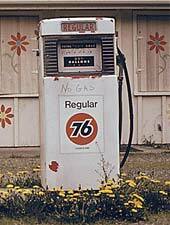 The ensuing ecological disaster is considered a formative event in the birth of the modern-day environmental activism and helps spur the passage of the National Environmental Protection Act in July, 1970. On October 17, OPEC member states declare an oil embargo against nations that had supported Israel during its war (known by many as the Yom Kippur War) with Egypt, Syria, and Jordan. The energy crisis that followed saw oil prices quadruple and the New York Stock Exchange lose $97 billion in share value, bringing on the worst recession since World War II.